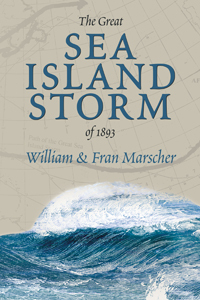 Heartbreaking and true, The Great Sea Island Storm of 1893 details human courage and perseverance in the face of the second most fatal hurricane in US history. On a Sunday evening in August 1893, a massive hurricane slammed into South Carolina and Georgia at high tide. The howling winds and pounding waters struck hardest at the Gullah communities along the coastal islands. Stunned by the sudden fury of the storm, the island dwellers took extraordinary measures to protect themselves. Clearly, they were no match for what many referred to as the “cyclone.” By the time the waters ebbed and the winds subsided, 2,000 or more had drowned and tens of thousands were left homeless, hungry, and destitute. Neither the US Congress nor South Carolina’s state legislature appropriated funds to assist the stricken people. Fortunately, Clara Barton, founder and president of the American Red Cross, took charge. In the first hurricane relief and recovery effort of the Red Cross, individuals and private charities sustained the survivors with grits and pork for almost a year. Rebuilding homes, food supplies, and spirits was a long arduous process. For the next sixty years, residents of one community held vigils every August, praying to be spared from such a catastrophe ever again.